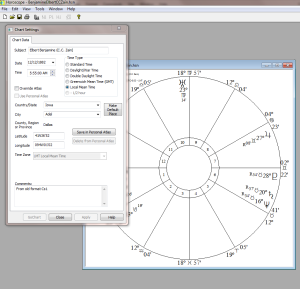 The Horoscope Astrology Program for Windows is designed for both professionals and students. 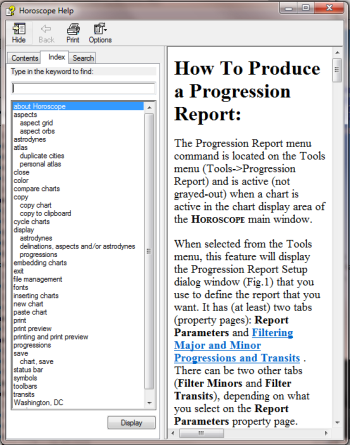 It has everything you need for thorough chart analysis, including both natal and progressed Astrodynes. Runs on Windows versions 7, 8 and Windows 10. Click here to see what other people have to say about using the Horoscope program. 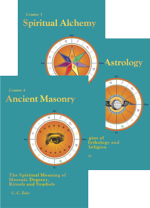 The Horoscope program uses the methods defined in the 21 Brotherhood of Light Courses by C. C. Zain (Elbert Benjamine), arguably the best astrologer of the 20th century. Horoscope 2016 Program Video Tutorial Series: For more about Horoscope 2016, we recommend that you watch these video tutorials in their ordered sequence, especially if you are new to the Horoscope program. Aspect grid showing astrodyne power and harmony individual aspects. Progression report with many features including Majors with reinforcing Minors and trigger Transits. Progressed astrodyne power vs. time aspectograph. 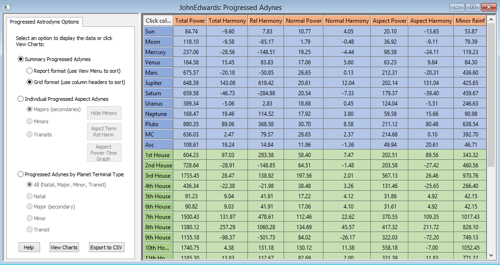 Progressed astrodyne grids for planets, signs, houses, individual aspects and natal and progressed terminals showing current progressed power and harmony, peak power and harmony, relative harmony and reinforcement power. Publishing features such a Copy to Clipboard and Object Linking & Embedding (Windows OLE) for embedding charts and tables in OLE-compatible applications like Word, Excel, PowerPoint, Adobe Illustrator and InDesign, etc. I love the program! How did I exist without progressed astrodynes? The Horoscope program is smooth and easy to use. The natal and progressed astrodynes are like an astrology shorthand: They get you into the reading quickly. Clients love the immediate information that astrodynes provide. The addition of progressed astrodynes give the astrologer timely information that has real relevance in the client's life. I just love this program and highly recommend it. I believe that the Horoscope Program (version 3) represents a new benchmark in astrological software. Its powerful tools calculate precisely not only natal but progressed power, harmony and discord in the birth chart. In other words, it removes the guess work and replaces it with precise astrological information providing the astrologer with exactly the power, harmony or discord of every progressed and natal planet. It shows every progressed aspect in operation in terms of its power, discord and harmony for the date under inspection. The 'Aspect Power-Time graph' is an amazing graphic that illustrates the reinforcing power of Minor progressions as they add additional power to the Major (Secondary) progressions in force. This enables the astrologer to tell at a glance just when events are likely to occur. The new Horoscope Program is full of user-friendly visual graphics like this that help the astrologer assess and comprehend the information it provides. Should you need help, then just hit F1 on the keyboard. It is as simple as that. Without doubt, as someone who has tried many different astrological programs in the past, this one beats the lot. If you are a professional or just aspiring to learn this science and art, I whole heartedly recommend this program. I have both used and also enjoyed the Horoscope program for many years. I've used other astrology software as well. The Horoscope program is in my opinion the best on the market because it is the only one that calculates Astrodynes, which is essential information that every astrologer should have. 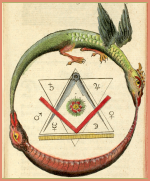 Astrodynes show the power, harmony, and discord of planets, houses,signs, societies, trinities, elements, and qualities. Like I said, every astrologer should have this information, but it is a must have for all hermetic astrologers. Paul Brewer, who is one of the best astrologers and the creator of the Horoscope program, has now hit a Grand Slam by coming out with the new and improved version which now includes calculations of progressed Astrodynes as well as a link to video tutorials on the help menu. 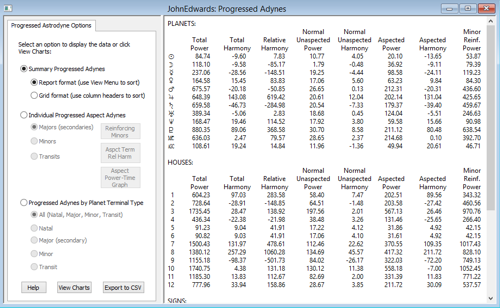 These tutorials explain all about progressed Astrodynes as well as using the Horoscope program. I recommend the new Horoscope 2016 program to each and every astrologer and person interested in astrology. Thank you Paul for creating this wonderful program! I highly recommend this software program! 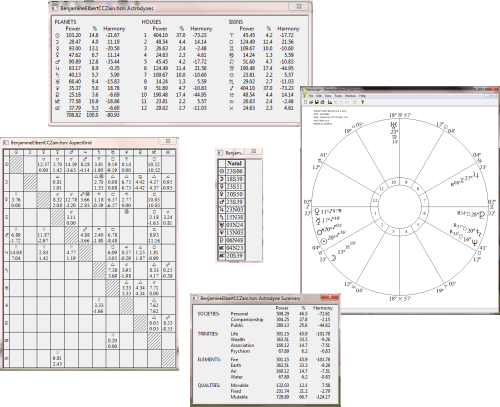 The new version of Horoscope is your one-stop-shop for calculating natal and progressed charts including aspect grids and Astrodyne reports. The Astrodyne report, with various ways to summarize the information, is invaluable because it has given me a precise and accurate starting point to present the client's strongest motivating urges (either harmonious or discordant) during the reading. This helps individuals to live more meaningful lives because they become empowered to make conscious and powerful decisions for themselves. I am able to run the PC based Horoscope software on my MAC because I installed Windows for Mac and Parallels. It was easy! 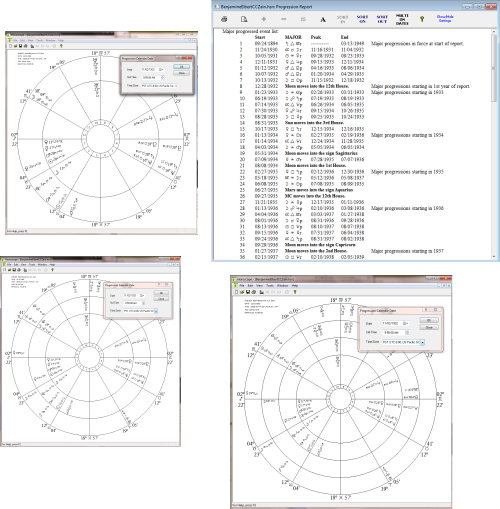 The Horoscope software is such a cherished tool for assessing and evaluating astrological charts! Here is a no-frills way of mapping planetary positions Tropically [in the Placidus format], uncomplicated by extraneous additions like mathematical points or myriad asteroids. Yet, a bare-bones chart can be complemented by the in-depth, extremely helpful method of assessing power, harmony and discord--called the Astrodynes—rating all of its chart features. And this latest edition of the software includes the opportunity to apply Astrodyne assessment to progressions, as well! 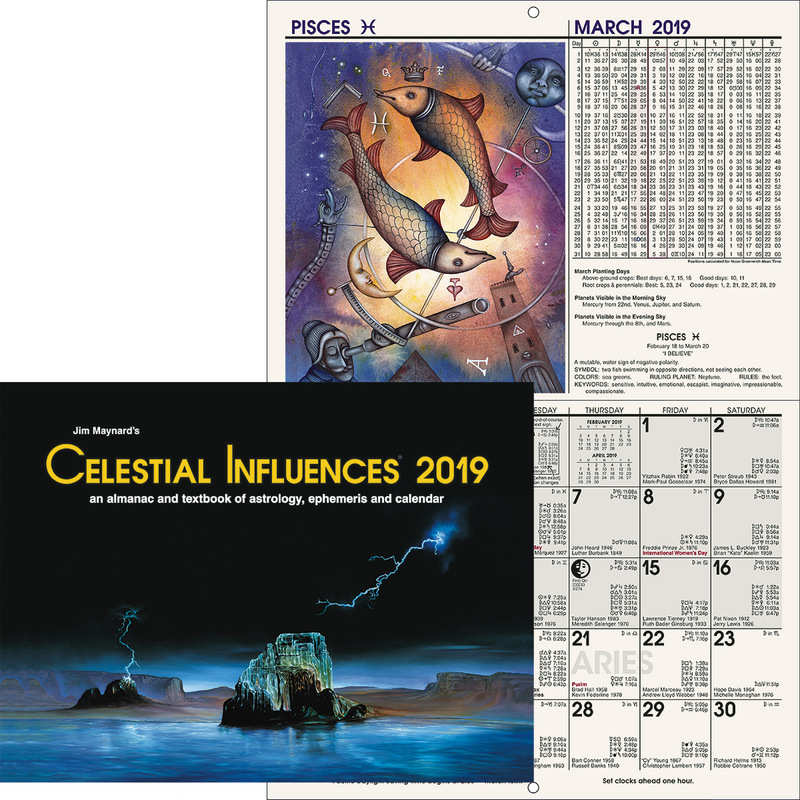 This makes the latest Horoscope program an even more empowered, quintessential, and elegant tool to help us understand the most important considerations to emphasize in our interpretations, even at a glance.